BC Mining Issue:Despite having powers to implement strong sanctions for non-compliance, the EA regulatory authority has been criticized for failing to enforce EA commitments and conditions. Fair Mining Best Practice:Rigorous enforcement is widely recognized as necessary to ensure that mining companies comply with legal requirements. Not only is strong enforcement desirable from the public’s point of view, it is good for business, and good for the environment. Enforcement is a necessary government (or private) action taken to ensure a mining companies complies with its legal obligations. Strong enforcement is not only desirable from the public’s point of view – it is also good for business as enforcement plays an important role in creating a level economic playing field. In BC, legal provisions exist to support strong law enforcement in mines. However, there is a problem in the practical implementation, or lack of implementation, of these laws. This is mainly due to the broad discretionary powers that BC’s regulatory authorities are granted in implementing environmental and social protection measures. This problem, coined the “implementation gap” by a 1980s study of environmental law in Canada, is still acutely relevant today. Regulatory bodies in BC have broad decision-making power, and few legal requirements to follow. This means that the law is not consistently applied to all mines. Another problem is the increasing trend towards voluntary compliance. This system has been widely criticized for not being effective. One solution is to publish the identities of violators and details of their offences. This practice has been effective for BC’s Pulp and Paper industry. Neither the Environmental Management Act nor the Mines Act requires that mines be inspected on any kind of schedule. The Mines Act says that an inspector may inspect a mine at any time, but this leaves open a possibility that a mine may not be inspected at all.. 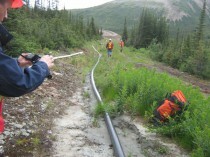 In contrast to BC, other regions have laws that require inspections at all stagesof the mining life cycle. Ways to solve these problems include allowing the public and First Nations to contribute to the enforcement of Environmental law, and creating an independent enforcement agency. Severe budget cuts to various enforcement agencies also contribute to this “implementation gap”. The lack of government capacity could be corrected by charging fees to recover inspection and administrative costs from mining companies. The following sections review the existing enforcement regime for mining activities in BC and suggest ways to improve enforcement at mines sites and protection of local communities and ecosystems from mining activities.